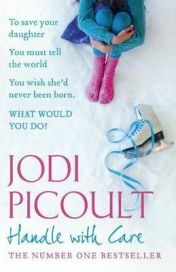 Jodi Picoult is one of my favourite authors and having read most of her books they usually meet my expectations and more although there have been a couple that I have not enjoyed quite so much. Generally though she writes thoughtfully and provocatively, liking to challenge her readers with moral and ethical dilemmas. Because of this I wouldn’t recommend reading her novels back tyo back and I definitely like to intersperse them with a bit of lighter relief. However, when the time is right, her books are brilliant page turners and this is how I felt all the way through reading Handle with Care. Handle With Care is a tragic and controversial modern day story about a little girl called Willow who was born with an extremely serious condition known as osteogenesis imperfect (OI) otherwise known as brittle bones. When Willow is born she already had seven fractures and broke a few more bones during delivery. In five years she has had more breaks than she or her mother Charlotte can count which has led to many hospitalisations and the need for specially adapted equipment. The cost, both in money and emotional terms, is very high for all concerned but even so her parents Charlotte and Sean love her greatly and would do anything and everything for her. This is why they are so shocked and stunned when a lawyer suggests that they could sue for wrongful birth based on the fact that the condition was not picked up during the pregnancy until it was too late to seriously consider alternatives. At first the idea is abominable especially as it would mean standing up in court and saying that they wish that Willow had never been born which is not true. Also, it would mean bringing a lawsuit of malpractice against Charlotte’s obstetrician and best friend, Piper. They can hardly bear think about it but the prospect of a huge settlement would mean that they could meet the crippling cost of things not covered by insurance which will only rise as Willow gets older. As you can see it is a moral and ethical minefield and if they choose to go ahead they know they will be vilified by the media and Charlotte will lose her best friend. And what about the implications for their two daughters – how will Willow feel if she hears her parents say that she should never have been born? Also, her older sister Amelia already feels overlooked because of all the necessary attention directed at Willow – she’s likely to get even less now unless she behaves in such a way to make her parents notice her. Handle With Care is a wonderfully absorbing read and one that will provoke the reader to question themselves in many ways. It could be easy to sit in judgement one way or the other but one never really knows how they might behave in extreme situations. It is also a heart wrenching tale as one observes the fallout from what is taking place and the potential breakup of a once solid and loving family. Jodi Picoult does her usual thing of telling the story from many points of view. In this case there are five main storytellers – Charlotte, Sean, Amelia, Piper, and Charlotte’s solicitor Marin who also has her own issues to deal with. It is interesting the way they are each telling their part of the story to Willow and presenting their own perspectives as they do so. I have found this style a bit confusing in some of her books but not in this one. Maybe I have just become used to her style of writing and I did feel that it provided great insights into all of these main characters. It helps the reader to understand their actions which sometimes stops you hating them because of what they are thinking about doing. Handle With Care is a very emotional read and does bring up many issues as well as interweaving a number of story lines beautifully. I was hooked from the very first pages and could hardly bring myself to put it down. I did enjoy the book even though some of the story lines were quite challenging and by the end I was quite emotionally wrung out – isn’t that what makes a great book though and one of the reasons that we want to read? No Comments on "Handle With Care"